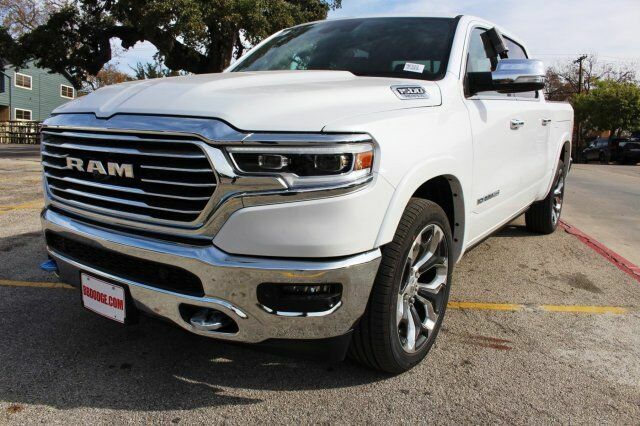 Turn heads in this LUXURIOUS bright white 2019 Ram 1500 Laramie Longhorn Crew Cab 4x4 pick-up with a powerful 5.7L V8 HEMI engine & smooth 8 speed automatic transmission at a great deal! This all new redesigned RAM features an attractive brown leather interior, a touch screen, SIRIUS XM radio, MP3, UConnect, Navigation, Harman/Kardon speaker system, dual panel moonroof, power seats, back-up camera, a bed liner, running boards, premium oversized tires, RamBox storage, & more. If you have any questions about this amazing find or any of our other vehicles, please call our sales office. Thank you for your interest & we look forward to hearing from you!